When my beloved chief editor appointed me with the task to review Skyclad, I gave him a weird look and checked him for fever. I have to admit that after Martin Walkyier left, I never looked back; I even changed the locks and threw away the keys. I would never expect for this album to prove me wrong and what happened was beyond my expectations. When I first hit play, I found my self hitting the “Next button after the first minute of each track and my shovel was about to be put to good use. I mean, that was something just similar to Skyclad, in some parts. But hey, I should at least give it another try. The next day I found myself hooked on it. Each time I discovered new things, and every listening session had more to offer than the previous one. “A Semblance of Normality features the Royal Philharmonic Orchestra. If you already said “not another orchestra album, there's no need to worry; the use is wisely chosen and only to parts where it adds to the whole feeling. The first track is pretty self explanatory; “Intro (Pipes Solo) where we are introduced to the beautiful Northumrian pipes. “Do They Mean Us is the only song you can actually call “bombastic; yet the orchestration is excellent and at no point overused. Almost same case with the heavier “A Good Day to Bury Bad News, which has very interesting lyrics so you'd better pay attention. “Anotherdrinkingsong, “The Song of No Involvement, “The Parliament of Fools, “Lightening the Load are probably the songs that will hit a familiar note to old Skyclad fans. “A Survival Campaign and “Like… a Ballad for the Disenchanted deliver some extremely heavy riffing along with violins while “Ten Little Kingdoms is one of the speediest songs I've ever heard. I think it invents its own “speed thrash folk genre… (!!!). A really fun song nevertheless. “NTRWB will remind you once again that this album is way different than anything you have heard before from Skyclad. Definitely nothing folk in there. “Hybrid Blues is a power ballad, really emotional and Kevin's voice fits perfectly; definitely one of my top picks of the album. “Outro (The Dissolution of the Parliament) is as self explanatory as the “Intro was; instrumental with heavy Celtic elements. Most of the album lyrics require you to have a very good understanding of the English culture, vocabulary and probably history to understand what this album is about. I say old chaps, I had an excruciating time, trying to understand what in the bloody 'ell “Do They Mean Us was talking about. Didn't keep it from the top positions of my playlist though, tee hee. Ok, Brit mode off. Old fans of Skyclad will probably hurry up to grab their torches and hunt the band down to the local castle. If you expect to hear another “Irrational Anthems you'll be highly disappointed. You have to realize that the band moved on and Kevin Ridley gave something different to the band. It's something different that I liked after giving the record a second (or perhaps a third) chance. It's a really interesting album, it's not entirely folk but contains many elements; from pure heavy to speed and symphonic metal. The band obviously put a lot of effort into it having worked with many musicians and lots of unusual organs. Kevin takes a while to get used to but his voice fits perfectly to these songs. 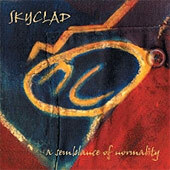 Due to the nature of the album, I'm sure non-Skyclad fans should definitely check it out too. My next “Fraoch is dedicated to you guys!